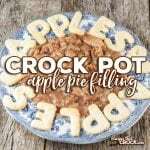 Delicious homemade apple pie filling made in the crock pot. Place apples in a 6 quart slow cooker. In a bowl combine all dry ingredients and then pour over apples and toss to coat.